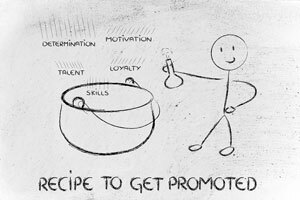 Promoting From Within - Do Fresh Ideas Require Fresh Faces? Promoting From Within: Do Fresh Ideas Require Fresh Faces? It is 5:30 a.m., you're awake and getting ready to go to work. But the job you have held with the same company for three years is starting to feel like the express elevator to oblivion! Your knowledge and commitment is high, your attendance record is stellar, your dues have been paid twice over and you know the operation front to back. Nevertheless, you feel as though you're still being overlooked for that promotion. Maybe there is a disconnect between yourself and your superiors who should recognize the quality of your work by advancing your goals and rewarding your drive and dedication. However, the fact is that employers are people too, and their motivation is most likely not in perfect harmony with assisting you realize your dreams. But, when your dreams are to serve one company to the best of your ability, given your time and talent, is it unrealistic to expect to be rewarded with a promotion? The swelling concern for jobholders over the issue of some companies policies regarding promoting from within or seeking outside talent is unfortunately not unique and is unquestionably frustrating. The New York Times states, "Some employers may not see the talent that's right in front of them and opt to hire from the outside rather from within. Such thought processes are common among workers and bosses, and a new study shows how they play out". A study by Matthew Bidwell; an Assistant Management Professor for the Wharton School at the University of Pennsylvania, found that external hires on average make around 18 percent more than internal employees with similar positions and yet their performance is often substandard. He also found that they are also more likely to quit or be let go within the first two years. Though the intentions of employers might seem relevant enough, best-laid plans often lead to internal company short falls and lack of production. This is especially true in the ranks of middle management where, if you've been at your job for more than a year, you should have a good idea of who's in it for the long haul. If you have ever been the management team member whose job it is to oversee daily labor costs, then you know firsthand what an expensive outside hire can do to the week in and week out bottom line and only time will tell if the quality of their work justifies their salary. This does not even examine whether or not they are the "right fit" for the position. Employees that have worked together over a consistent period of time have a better feel for each other and as a result know which buttons not to push, they know who may be dealing with family or medical issues and who can be counted on in a crunch. Whereas someone hired from the outside lacks this knowledge and could possibly create workplace drama by disrupting what was already a cohesive team. Entrepreneur.com gives a heads-up on how to successfully troubleshoot promoting from within. "Talk about development early and often: The development of your company's growth is vital to the health of your bottom line. So the more discussions you can have the greater potential for growing spurts. Develop leaders across all levels: Seek to optimize your strongest leaders and don't overlook the up and comers that just might have what it takes. Don't make guarantees: Whenever possible take time to clarify what the process will be to promote from within to your employees. And lastly, hold employees accountable: Just because an employee has been on the job for an extended period of time does not mean they are next in line for a promotion, rather this criteria should be based on a fair assessment of their job performance." If not you then who? If you believe that you are in line for a promotion then communicate that to upper management. If you're not willing to speak up and ask for what you want, then be prepared to accept what you get which could very well be dealing with an outside hire.